Voice control that's systematic! True to this motto, the innovative DialogPlus voice control is now also available for the seasoned and time-proven THB Bury UNI System 8 Car Kit. You expect a state-of-the-art hands-free kit to offer excellent sound quality, be easy to use, and ensure you stay safe on the move. And with a touchscreen and the new Dialog-Plus voice control system, the CC 9060 Crystal does just that. You expect a state-of-the-art hands-free kit to offer excellent sound quality, be easy to use, and ensure you stay safe on the move. And with a touchscreen and the new Dialog-Plus voice control system, the CC 9060 does just that. Bluetooth® Music streaming adaptor for wirelessly streaming your music tracks through your iO Play or iO Talk from your iPod or iPhone (1st Gen. If you want a Bluetooth aptor for iPhone 3G our Charge & Play adaptor is for you). This also gives you the ability to skip track and pause your iPod / iPhone. iO PLAY opens up the world of Music streaming & Mobile Phone Hands free possibilities. iO Play is fully installed into your vehicle and integrates into your existing Audio System. "WILL PAIR WITH TWO PHONES AT THE SAME TIME"
Listen to your music as it's meant to be heard with Motorola TK30. This Bluetooth®1 pro-install car kit provides the technology for clear hands-free calls, connectivity to two phones at once along with professional sound quality for your iPod®, iPhone®, or other personal music device. The Nokia Advanced Car Kit CK-7W is for you if you want a convenient way to make handsfree calls while you're in the car. Compatible with an extensive range of mobile phone brands and models, the Nokia Car Kit CK-300 offers convenient call handling, high quality audio output with echo cancellation and noise reduction, and music streaming capabilities that help you make the most of your mobile device while you're on the road. The driver's seat is yours - keep it beautiful when connected to others with this elegant car kit. In car. In sight. In touch. Go handsfree and footloose with a brilliant dashboard screen and easily play your mobile music in the car. The adjustable full-colour display mounts onto your dashboard, so you can easily see who's calling. 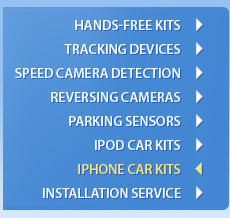 The innovative and affordable Nokia Car Kit CK-200 is packed with smart new features. Easy installation and unbeatable performance put it way ahead of the competition.Heres the deal. Equipped with a 200 W MOFSET amplifier, the Parrot RKi8400 can offer you a new musical experience. Totally integrated into the vehicle's audio system, conversations and music are transmitted via the speakers for maximum listening quality. To make the experience even more enjoyable, the RKi8400 has a built-in equaliser and includes sound effects that can be adapted to any style of music.